If you hadn’t already noticed, my banner picture on this blog is a photo of ‘Sophia Loren’ and her sister ‘Anna Maria Scicolone’. Sophia is the profiled blonde on the left who’s face is hidden from view. Her sister is pictured facing left; her only sister and four years her junior. This picture, to me, is the essence of this blog. It shows the love of sisterhood with no fear of physical expression of love and connection. Unless one is openly gay or lesbian, its not considered the norm for same-sexes to show such affection, or to walk down the street arm-in-arm. In places like Italy however, this is very normal. One only needs to take a stroll on a typical Italian ‘Corso’ on any given day of the week and see two heterosexual men walk arm-in-arm (as would heterosexual women), simply because they feel comfortable showing their affection for one another in the most basic form of friendship. In fact, you will see this more often that not. If a heterosexual man tried that with another here in this country, he’d either be socked in the eye, or have his buddy recoil in horror, and possibly re-think hanging out with him. Conversely though, some of these European traits do make their way into our culture here, especially among the older generations. For example, in my parents home, I regularly see the male adults in my family greet my father with a kiss on both cheeks, to show their love and respect for our aging Patriarch. As a woman watching them, I feel a sense of admiration in their ability to be secure in their manliness, yet still feel comfortable showing this level of affection. On my Pinterest page I have a board dedicated to Sophia Loren. I have searched the internet looking for her most memorable photos. In several of the pictures, I’ve captioned many of them with some of her quotes about family, aging, beauty, and life. I couldn’t articulate an answer without going into a long and drawn-out explanation such as the one I’m giving now… other than “she seems familiar to me, and I just love her”. In 2006, I had the good fortune of seeing her in person at Carmen’s banquet center in Hamilton ON. She was in her early 70’s at the time and even in her prime years, I was overcome by her beauty and personal presence in a room. How can I explain it? Its not even the celebrity in her, but more of ‘who’ she is, and what she represents, to all women of Italian origin. She is truly a cultural icon and when one meets her and speaks with her, an air of confidence, class, distinction and femininity surrounds her. For me, it was the familiarity of her. I think of my mother, my sister, my daughter, my friends. That’s why I have a Sophia Loren board. Many of us already know some details about her past – born Sofia Villani Scicolone, in Naples before WW2 – a rags to riches story, if you will. Her father refused to marry her mother whom he provided no support to, and thus Sophia and her siblings spent their childhood in poverty. She was discovered after entry in a beauty pageant, at the age of 14, in 1949. Although she didn’t win the pageant (can you believe it? she didn’t win the pageant…), she did manage to catch the eye of a famous Italian movie producer Carlo Ponti, whom she had a relationship with, and married 7 years later. In the ensuing years, she landed a five-movie contract with paramount pictures in the late 1950’s. It was at this time that her professional career soared, making her one of most sought-after leading ladies of the mid 20th century. It was here that she essentially proved her worth as an actress. You can google her IMdB to see her past accomplishments so I wont go into them here, however it was her performance in Two Women that earned her an Academy Award for Best Actress in 1962 and made her the first artist to win an Oscar in a foreign-language performance. It was also her personal experience during the war, and especially having to bear witness to her mother’s suffering, that helped her to ‘get into character’ for the part. When I heard her descriptions of this time in her life, I immediately thought of my own mother who had similar stories, and it pierced my heart. Sophia Loren has many philosophies on life which parallel many others in the Italian community. Her take on a healthy lifestyle, minimizing stress, a hard work ethic, work-life balance and prioritizing ones life ~ having children ~ taking time to be a good mother, along with setting goals in life, and wholesome eating (and good genes) have helped her to live a long and healthy sought-after life. She was absolutely not without hardship. In fact, she had much adversity in her life. “Everything you see, I owe to Spaghetti” ….. I could never, in million years, see Sophia Loren singing the praises of a gluten free diet, just for the sake of eating gluten free. And thank goodness for that!! Just as a little extra treat on today’s blog I thought I would add a quick fettucine recipe that is easy to make, especially for those quick week night meals. In a frying pan on medium heat, saute the garlic, in a couple of dollops of olive oil, until lightly browned. Remove from oil. Add onions and fry on medium heat until transparent. Add cherry tomatoes but give just a light simmer for two to three minutes (not necessary to cook all through). Add salt and pepper to taste. In a 5L pot, boil water for pasta and salt it. Add Fettucini noodles and cook until al-dente. Remove and drain pasta water. Immediately add the tomato mixture, chopped fresh basil and buffalo mozzarella. Toss together (note the buffalo mozzarella will want to settle to bottom of the pot), Transfer from pot to large family style pasta serving bowl and garnish with grated parmesan cheese. 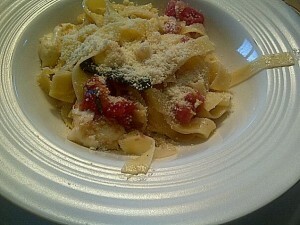 A nice plate of pasta, a nice glass of wine and buon appetito! This entry was posted in Recipes and tagged Anna Maria Villani Scicolone, Best Actress Oscar 1962, Caprese Salad, fettucine, Sophia Loren, Sophia Loren Pinterest, Two Women. Bookmark the permalink. What’s so great about Pokemon Go? ?